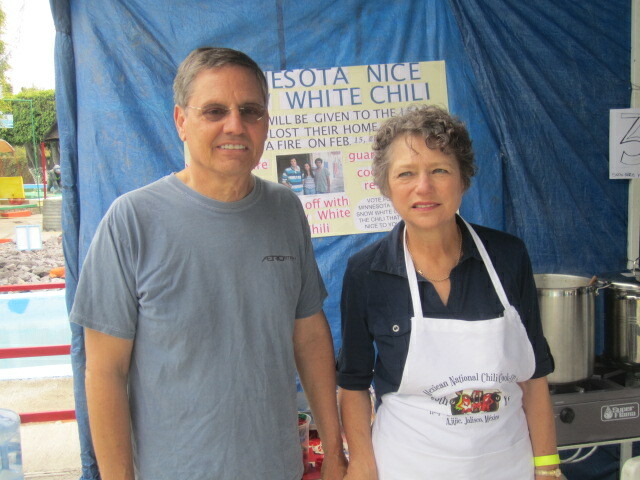 This was the 38th annual Chili C00k-off. 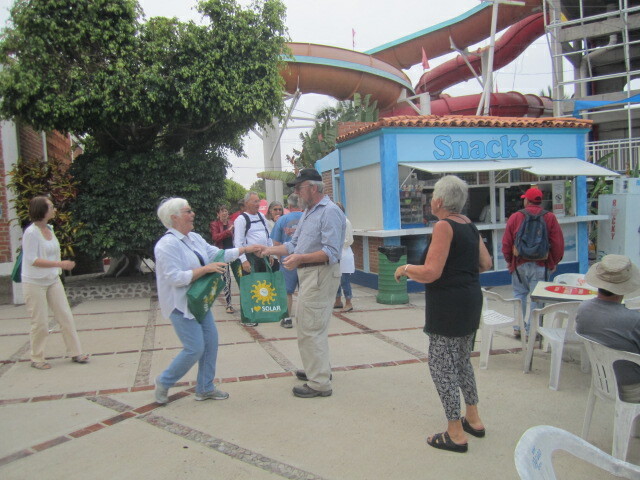 It was held in the Tobolandia water park in Ajijic on February 26, 27, and 28th, 2016. It is the biggest fund raising event of the year for all the charities in the area. 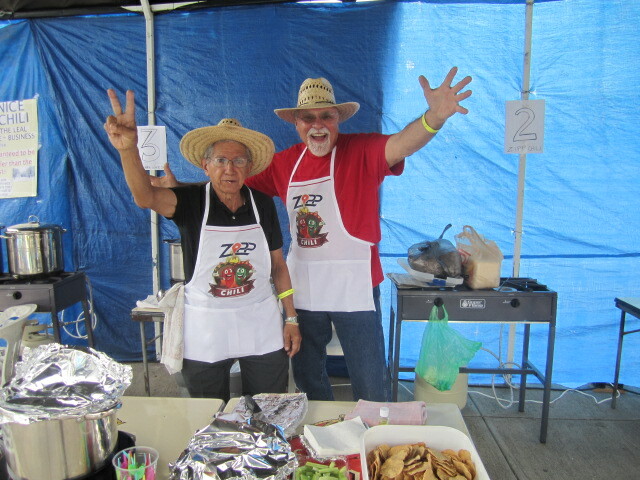 If you would like to be part of next year’s event, please go to their website: www.mexicanchilicookoff.com. Also, if you would like more detailed information about the event, you will find it there. The first Stand first stand was a real treat, both to the eyes and the stomach. Check out all the food and drinks set out on the table for visitors. 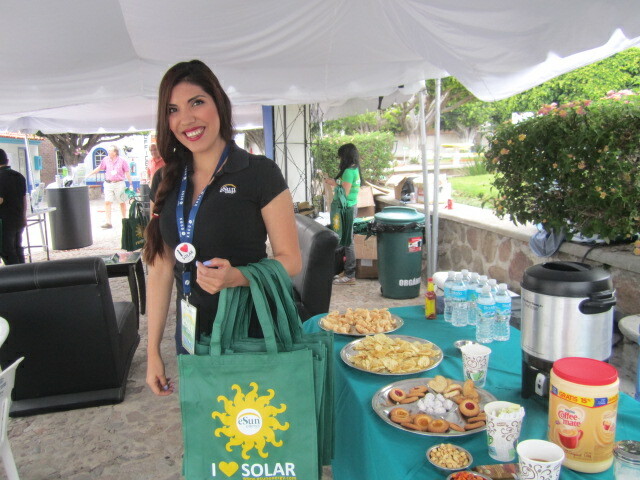 Plus the woman with the beautiful smile, was handing out cloth bags to everyone. This was all provided by eSun energy. Thank you eSun…. I was thirsty and I loved the cookies. 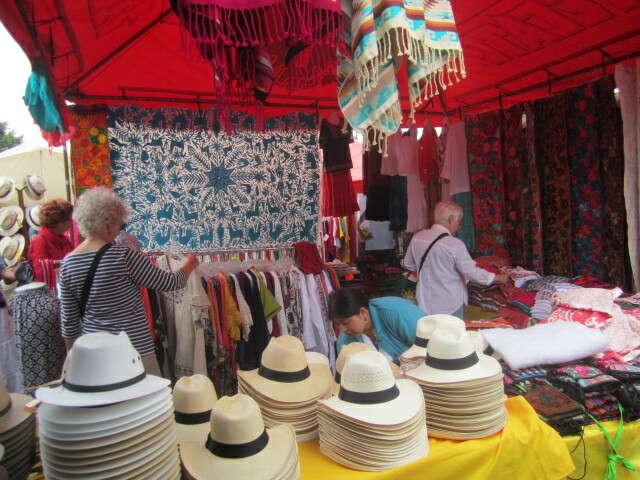 Many of the craft stands were locals. 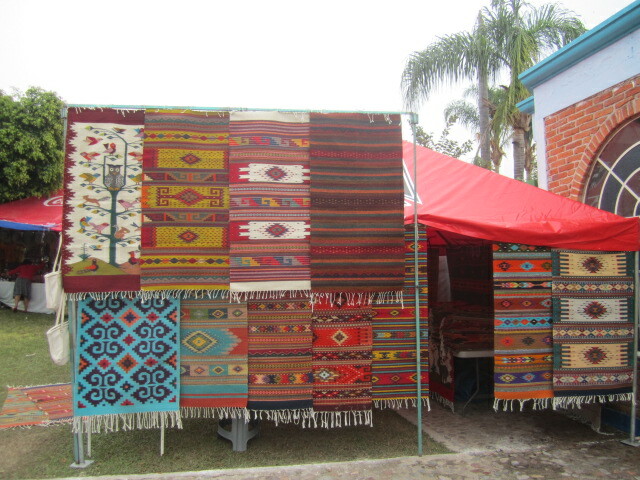 I recognized the rugs from their stand along the carretera in Ajijic. They are 100 percent wool. Beautiful. Those hats must have been popular during the Cook-off days. The weather was very warm and the sun was bright. 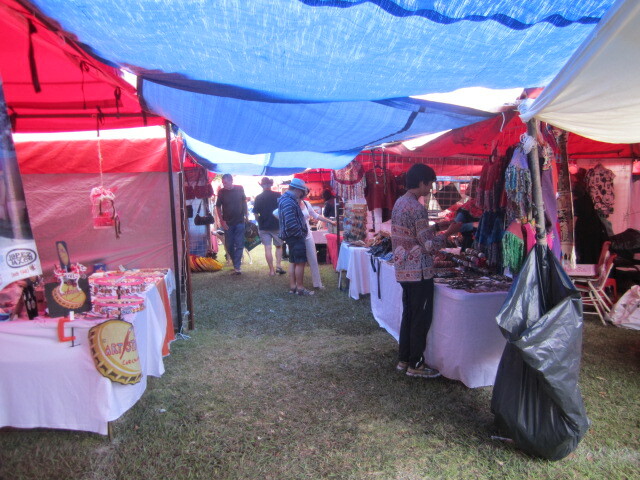 The craft booths were located all over the Tobolandia grounds. I believe there were even more craft booths this year than last year. There were 58 art and craft booths and 7 food and drink booths. Above is a long view of just a few of the craft booths. It is nice that they made the walk area shaded. 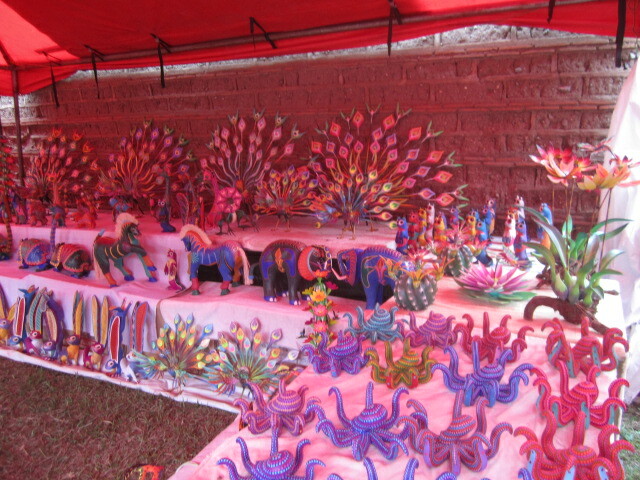 The beautiful balsa wood crafts in the above photo are from Oaxaca. 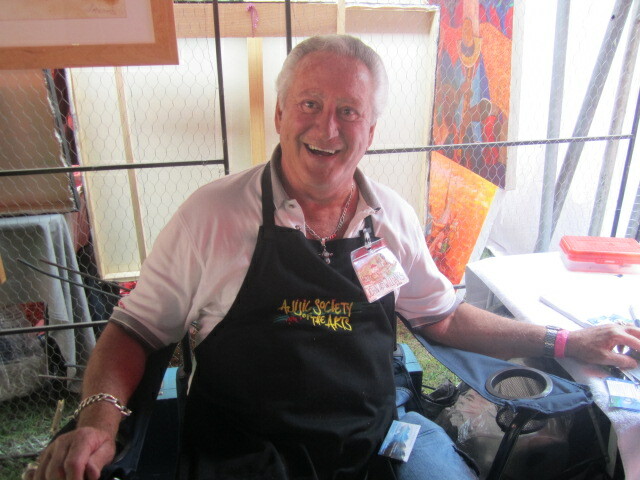 Above is a photo of water colorist John McWilliams. 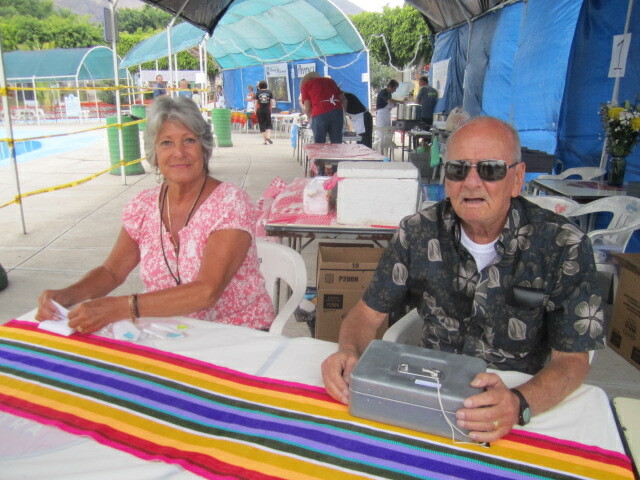 He looks so happy because he always sells many of his watercolors at this event. He is very talented. The beer stand wasn’t selling many beers when I took this photo but maybe because it was only ten in the morning. A bit too early for a beer. 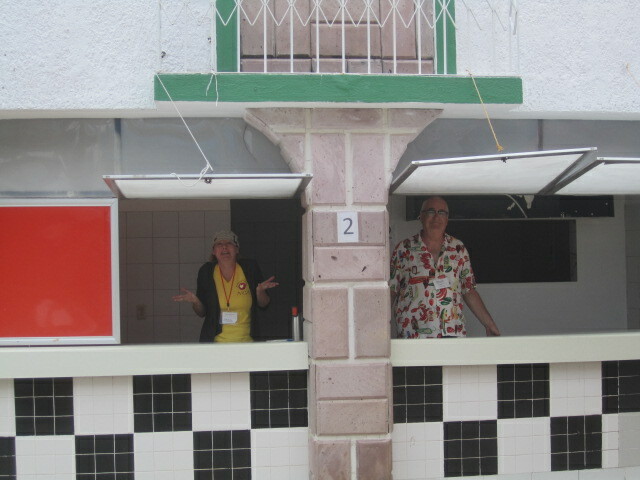 These food stands were all part of the fund raising for various charities. Each charity had a stand. The ribs looked very good. The money from the ribs went to the School for Special Children. If you would like to know more about these charities, please go to the Chili Cook-Off website. 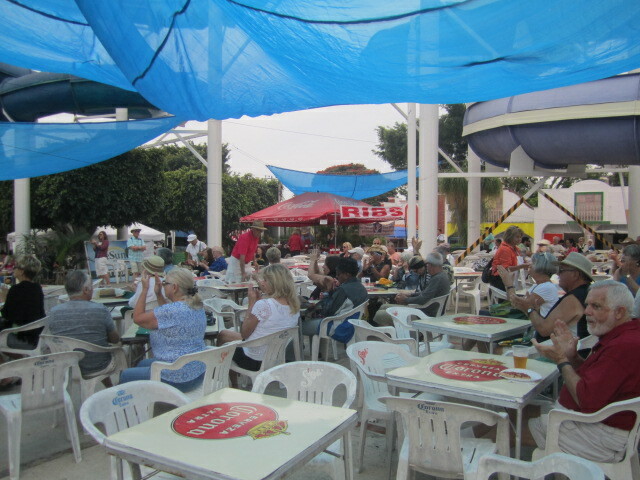 Most of the food booths were in this main eating area. 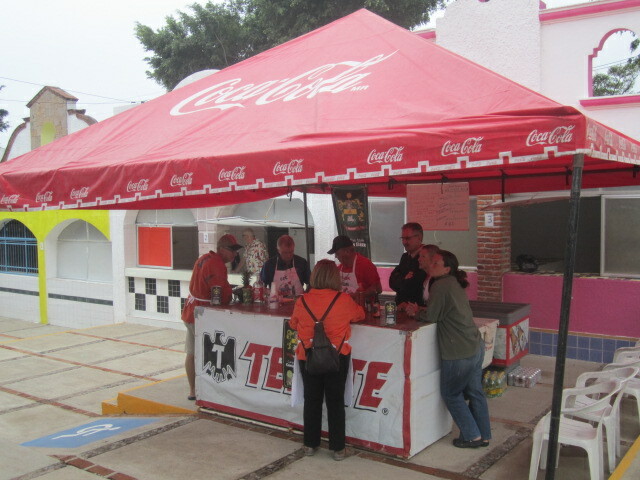 The people in the outlying areas didn’t get as many customers. There was entertainment going on during all three days. I only saw one band. But there were other bands and dance performances. Also, on Friday there was a Margarita competition. Now that would have been fun to sample. 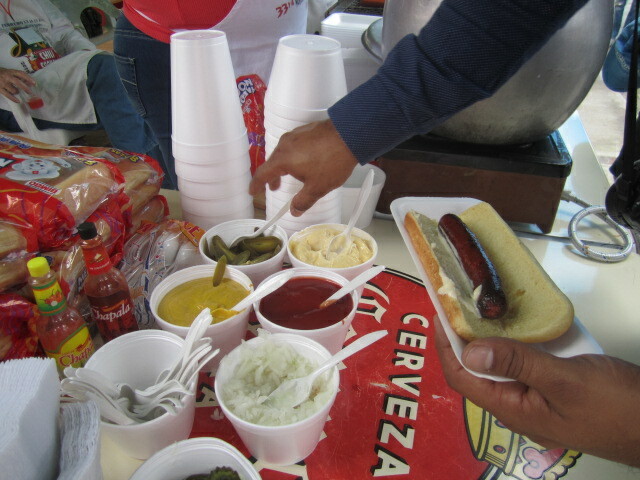 That hot dog looked good but I was saving my appetite for the chili tasting. 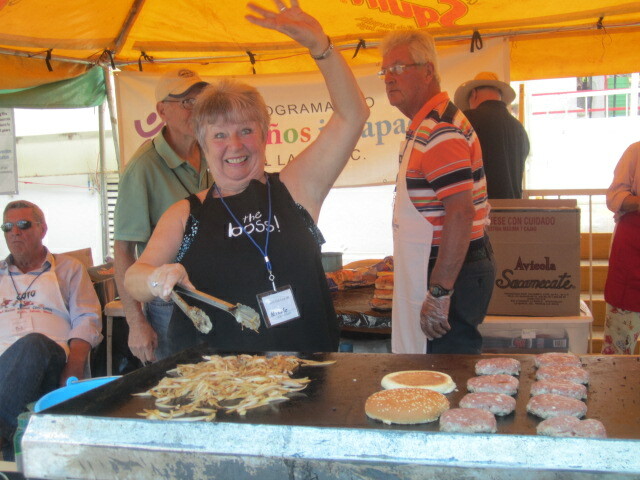 Yum, grilled hamburgers and onions…..This stand was for Ninos Incapacitados del Lago. The woman in the photo above was shrugging because she had no customers. Her booth was located a bit away from the main area and people hadn’t discovered it yet. Hopefully, it got busy later on in the day. The woman in the above photo was having a great time dancing alone in front of the band. The name of the band was Blue Jay (Pinkus). At least that was the name listed on the program. I have no idea of why the second name is in parenthesis. More dancers. 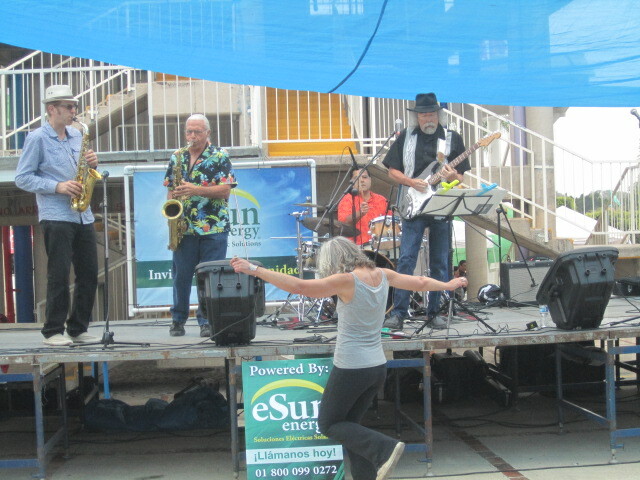 It isn’t only the young who have the urge to kick up their heals to a good blues band. 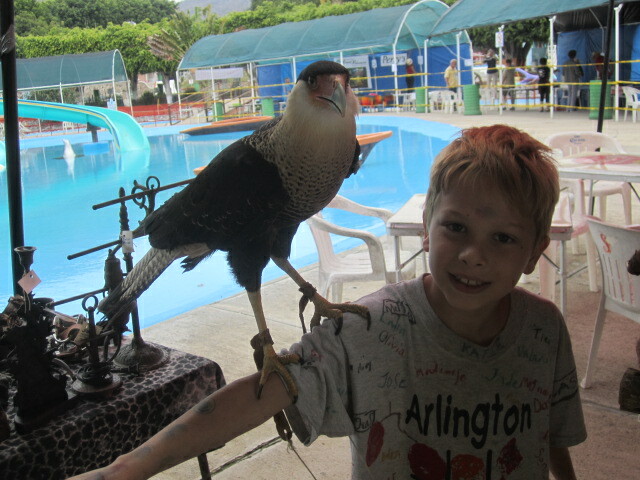 The boy in the above photo was at the booth for the protection of the animals. He could have also held a snake. I liked the above photo too. 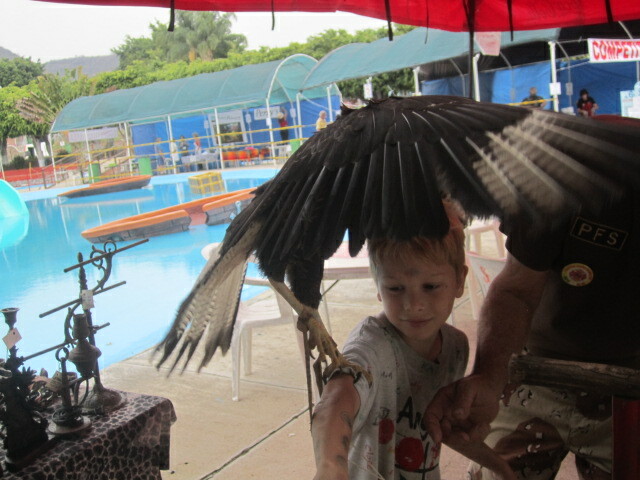 The boy was very brave. I wouldn’t have managed it. 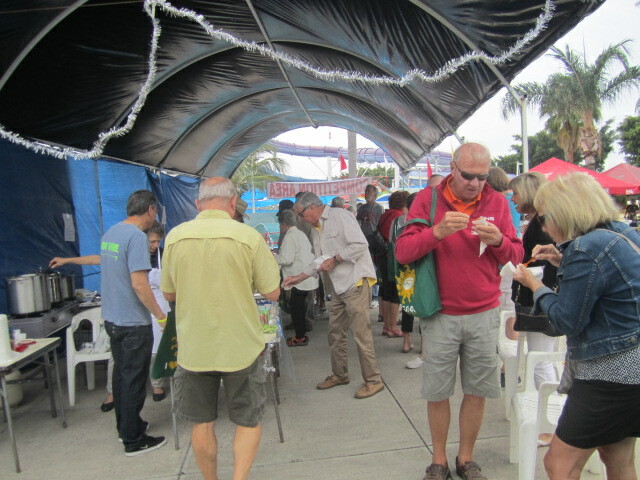 It looked like as many chili eaters as last year but not as many chili makers. There were only six stands on Saturday and two of them didn’t show up. Of the four left, one hadn’t arrived yet with the chili. 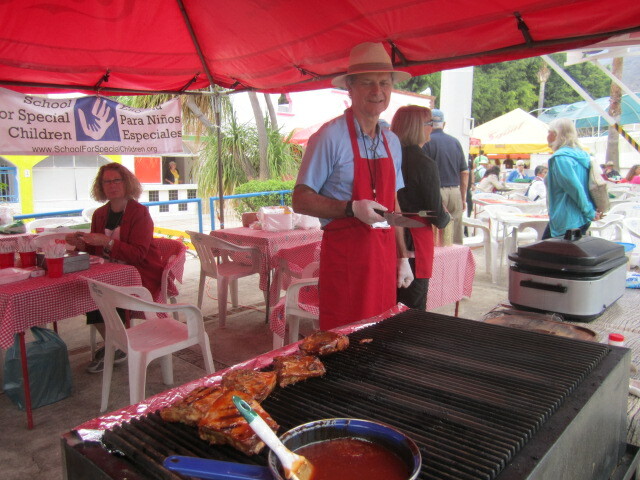 So it was slim pickings with chili for the eaters, but it was all delicious and great fun. Another problem that I discovered from talking with several people after the cook-off is that they didn’t know where the chili was located. They of course were first time visitors and they didn’t see the huge sign that was over the bridge saying COMPETITION. This year I didn’t get the names of the participants. It was just too busy for me to interview them. The couple in the above photo made White Chili. It was very different from any other chili I have had. But it was delicious. 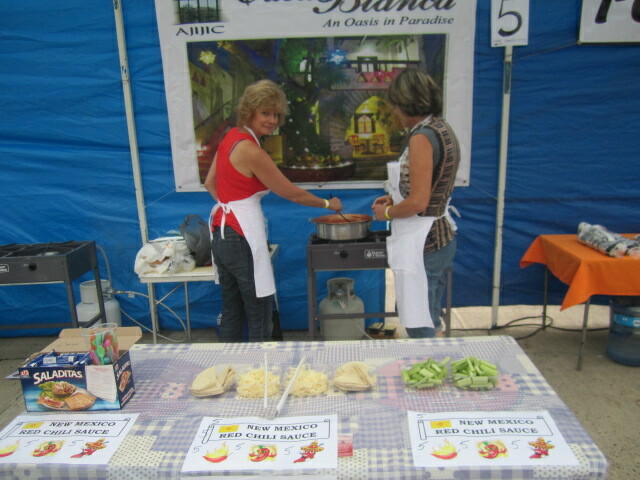 These two women were cooking up a storm. They had grated cheese, crackers and sticks of celery out for people to eat with their chili. 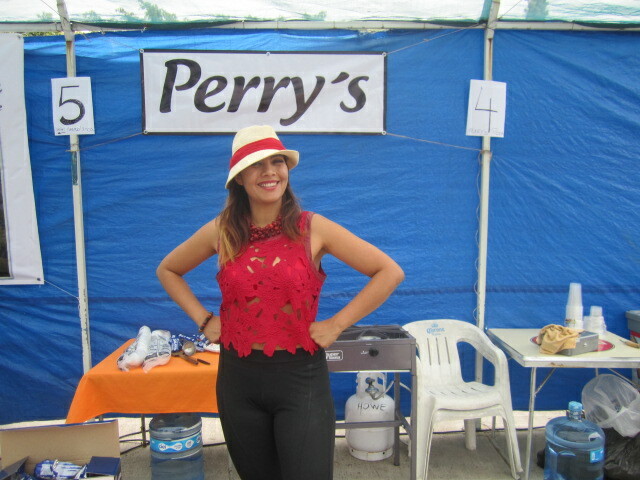 The young woman in the above booth was waiting for the chili to show up. At least she was good matured about it. The people in the other booths were already serving out their chili. 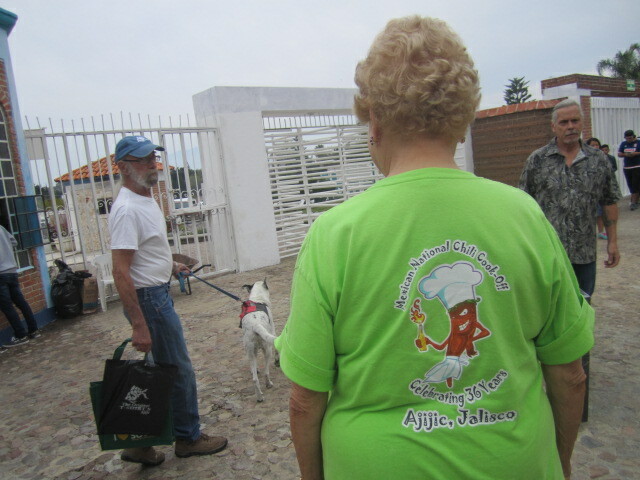 I am guessing that the woman wearing the Chili Cook-Off shirt bought it two years ago. It looks like a much loved shirt. If you are ever in town during this event, I hope you will not miss it. Great fun! And then you can buy your own t-shirt to take home with you. Thank you for the pictures. It looked like everyone was having a nice time. I also enjoyed your comments under the pictures.